ZIPLINE 31 STATIONS and Trekking 1 Hrs. 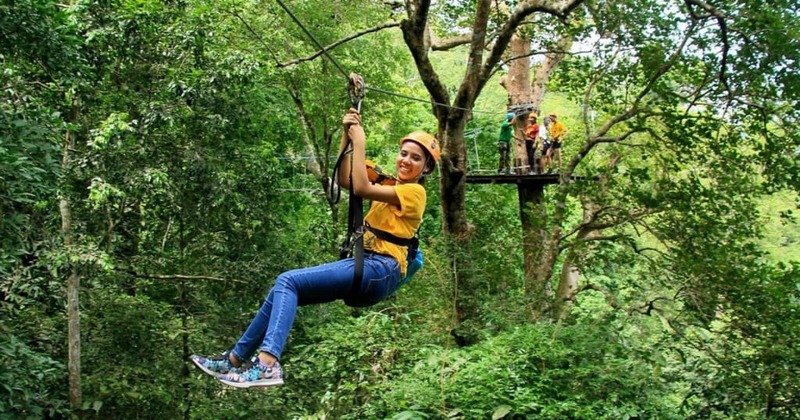 Experience an awesome Zipline Chiang Mai Tour experience with 31 platforms, varying in length from 20 meters to the thrilling 400 meter zip line. Along with a peaceful 1 hour trek. Enjoy the Flight of the Gibbons Zipline, this acclaimed attraction will not disappoint. Return to Chiang Mai in the evening and next day come out for a day of Northern Thailand’s premier whitewater. Chiang Mai undoubtedly offers some of the of the best Ziplining experinces in the world. With large trees and very diverse plant and animal life. You want to make sure you choos a great outfitter to go with since there are many zipline tour operations in Chiang Mai. Our experience is an awesome zipline tour experience with 31 platforms, varying in length from 20 meters to the thrilling 400 meter zip line. This 31 platform zipline tour includes tree abseiling and a canopy bridge walk all included within our packages. Most of the platforms are between 10 and 20 m above the ground. This zipline Chiang Mai canopy tour is a great way to see vistas in the jungle. It is fun and incredibly safe. Come and join us on an amazing day or multi-day Zipline in Chiang Mai excursion! Zipline Chiang Mai Tour – 31 Platforms and a short trek! Great for the Whole Family! Experience an awesome Zipline Chiang Mai Tour experience with 31 platforms, varying in length from 20 meters to the thrilling 400 meter zip line. 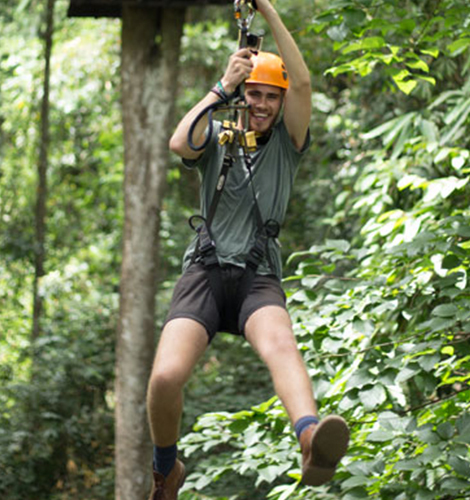 31 platform zipline Chiang Mai includes tree abseiling and a canopy bridge walk all included within our package. Most of the platforms are between 10 and 20 m above the ground. This zipline Chiang Mai canopy tour is a great way to see vistas in the jungle. It is fun and incredibly safe. Afterwards, we’ll take you on a jungle trek through the Mae Taeng valley, one of Chiang Mai’s most beautiful locations. This is a perfect trip to do with family and friends. 31 Platform Zipline Chiang Mai Flight is great to fly through the jungle back and forth across the river if you keep your head about you and look upstream sometimes you can get a glimpse of a waterfall in the background. Most of the platforms are between 10 and 20 m above the ground. There is a 400m zip as well which is one of the highlights and at one point when you’re going back and forth across the river you may be close to a hundred meters in the air. This zipline canopy tour is a great way to see vistas in the jungle. If is fun and incredibly safe. Please note that the Zipline has a weight limit of 100 kg or 220 LB. 1 hour ATV trip: 8Adventures operates our ATV Tours in Chiang Mai as ‘4×4 Off Road Safaris’. ATV’s provide awesome and responsible transportation to amazing places and vistas. For a fun, safe ATV tour in Chiang Mai look no further than 8Adventures. 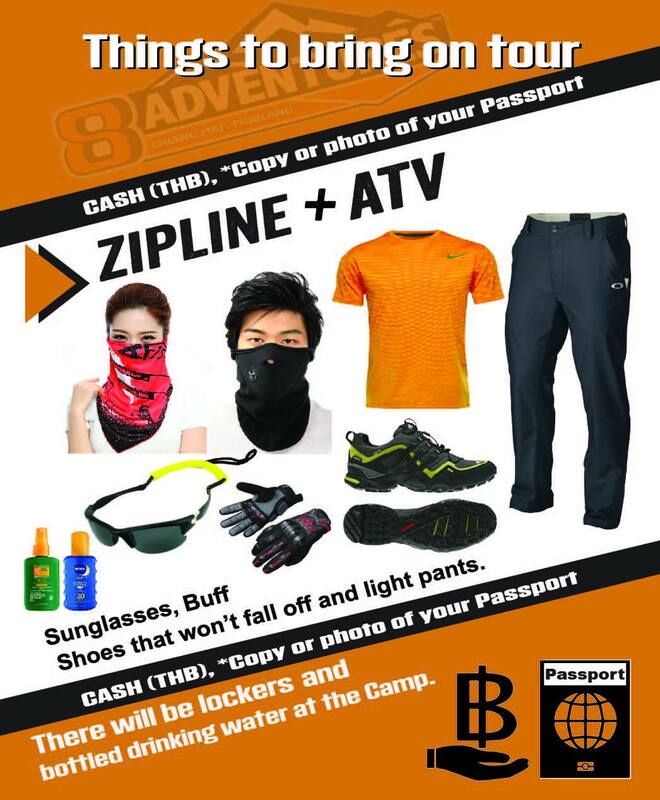 For Zipliing Chiang Mai – All participants should be in reasonable physical condition. If you have a heart, back or neck condition, broken bones or are pregnant, our activities are not for you. If you’re not sure or would like clarification please contact us. Zipline Chiang Mai Tour: 7 years to 70 years of age. Weight limit of 120 KG or 260 LB. Please note we need to know in advance for weights that are above 100 Kg. All participants should be in reasonable physical condition. If you have a heart, back or neck condition, broken bones or are pregnant our activities are not for you.